Volunteer applications can be created by your volunteers through the volunteer portal. However, you may choose to accept applications outside of the portal, in which case the information from the application must be entered into Causeview..
Save the volunteer as an individual. 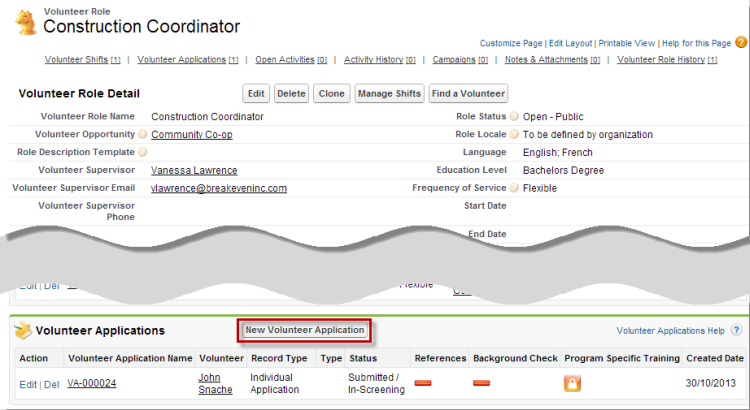 Before a volunteer application can be created, all volunteers must be saved in Causeview as individual constituents. Create a new individual in Causeview and complete as much information as you are able about the volunteer. You do not have to fill in the volunteer profile, as all of that information will be automatically transferred from the volunteer application. The volunteer application must be created from the detail page for the volunteer role. Locate the role the volunteer is applying for through the volunteer role tab or through a search and open the detail page. From the volunteer application related list, click on the New Volunteer Application button. You will have to select the type of application you would like to create. The individual application allows you to enter a lot of information about the volunteer and to track the background check, criminal record check, and training status of the volunteer. It should be used with new volunteers who have no volunteer information saved in Causeview, or for established volunteers who are applying for a role with a higher clearance level or new training requirements. The sign up application is much more simple, and is used when a volunteer is already established as a volunteer with your organization. Select the correct application type and click Continue. In the case of a Sign Up application, the only information that should be filled out for a new application is the volunteer’s name and the status of the application. Look up the volunteer’s name in Causeview by clicking on the magnifying glass and searching through all individuals. Then select an application status, and save the application. The Individual Application is much longer, as it is used to capture as much information about the volunteer as possible. None of the information is required by Causeview, allowing you to enter only the information that is important to your organization. Best practice is to always complete as much information as you have available. The information section of the application is used to save information specific to the potential volunteer’s interest in the volunteer role. Select the volunteer’s name from the full list of individuals in Causeview by clicking on the magnifying glass. Select the “Type” of application to indicate whether the applicant is a new volunteer or an established volunteer applying for a new screening level. Select the application status, which in most cases will be “Submitted / In Screening” for new applications. Finally, identify the volunteer’s availability for the role by clicking on a time of day and then using the right arrow (>) to move the time into the “Chosen” box. Select all of the available time sections that are known for the volunteer. It is important to complete availability information as fully as possible, as it will be saved to the volunteer profile for the volunteer and used when searching for volunteers to fill new volunteer roles, or as screening information if the volunteer uses a “Sign Up” application for other volunteer roles. 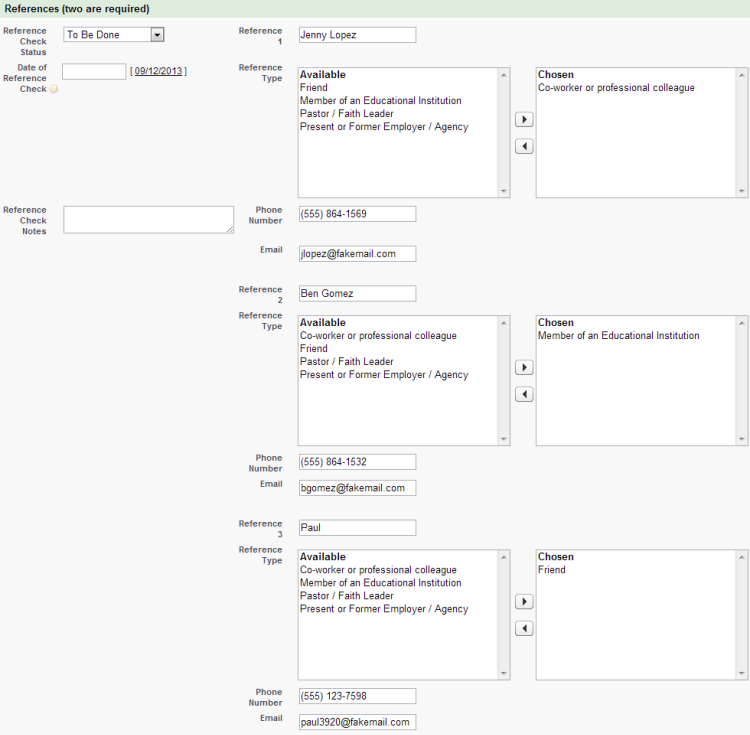 The employment details section of the volunteer application is used to save information in Causeview about an applicant’s place of work and education. Select the applicant’s employment status, and fill in their title at work, the name of the company they work for, and a short description of the work they do. A selection list allows you to indicate known giving programs the company may participate in. The education information may reflect either education complete to this date or currently active education, if the applicant is a student. Select an education level and fill in the name of the school and program. The volunteer interests and skills section acts similarly to a resume, allowing the applicant to indicate their reasons for volunteering with your organization, the skills they can contribute, and their preferences for where they will volunteer. It is important to complete this information as fully as possible, as it will be saved to the volunteer profile for the volunteer and used when searching for volunteers to fill new volunteer roles, or as screening information if the volunteer uses a “Sign Up” application for other volunteer roles. Select and move into the “Chosen” box all relevant reasons for volunteering, professional skills, and preferred locale(s) for the applicant. Also select the maximum miles the applicant is willing to travel in one direction to complete a volunteer shift. 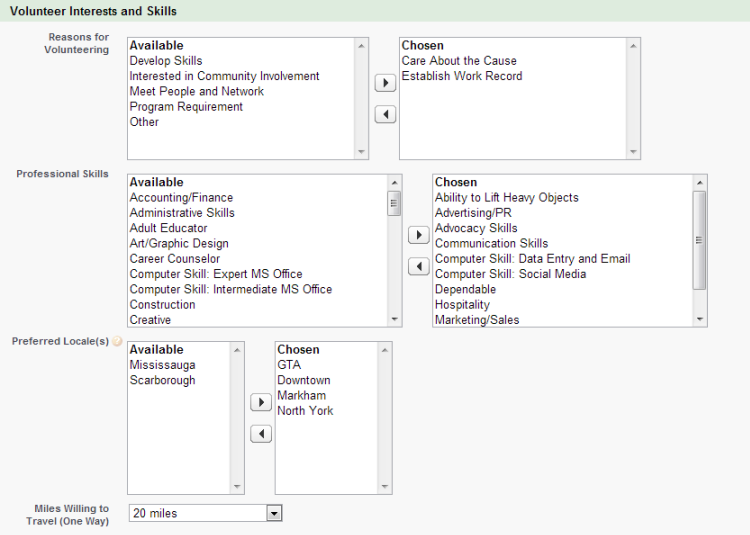 The applicant profile questions reflect important additional information which will be saved to the volunteer’s profile. Select all ways in which the volunteer heard of your organization and the volunteer opportunity, and all language skills the volunteer has. The application allows for three possible professional or personal references. While the application may indicate that two references are required, this text can be adjusted to suit the needs of your organization. If no reference check is required for a volunteer role, the reference check status can be set to “Not Required”. If a reference check is required, fill in the name, phone number, and email of the referee and select the relationship between the referee and applicant as the “Reference Type” for all available references. If the reference check has been performed before the application is saved in causeview, complete this information. Otherwise, set the reference check status to “To Be Done” and leave the date and notes fields blank and return to the application at a later date. The emergency contact fields are used to save information about the applicant’s emergency contact when they are volunteering for your organization. Enter the emergency contact’s name, relationship to the applicant, and phone number. This information will be saved to the volunteer profile on the individual’s detail page for quick access. The terms and conditions section is very useful if you plan to perform a criminal record check on volunteers, or if you have documentation volunteers must agree too, such as terms and conditions or a liability release. These fields need only be used if they are suitable for your organization. Select the applicant’s declaration of criminal record status and willingness to undergo a criminal record check. If the applicant agrees to the terms of the volunteer waivers, check the boxes. The remaining sections of the application - Training Details, Background Check Details, and Application Exit Details - are intended to track the screening and placement progress of the applicant. If training specific to the program or a background check are not required for the role, set the Status to “Not Required”. Otherwise, select the appropriate status for the training and background check and, if they are completed, fill in the date and any notes. The reason for decline or the reason for exit of a volunteer should be filled in when the application status is changed. 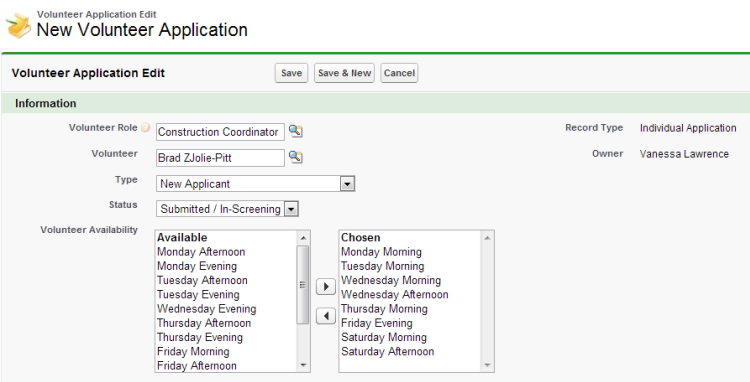 These fields should not be available to be filled in unless the application status is set to “Declined” or “Exited”. When first creating the volunteer application, the exit details section will likely be left blank. When all of the volunteer application information that you have available is filled in, you can save the application using the Save button, or use the Save & New button to create another application for the same role. If you choose to create a new application you will begin again from the application type screen, where you can select and individual or sign up application. 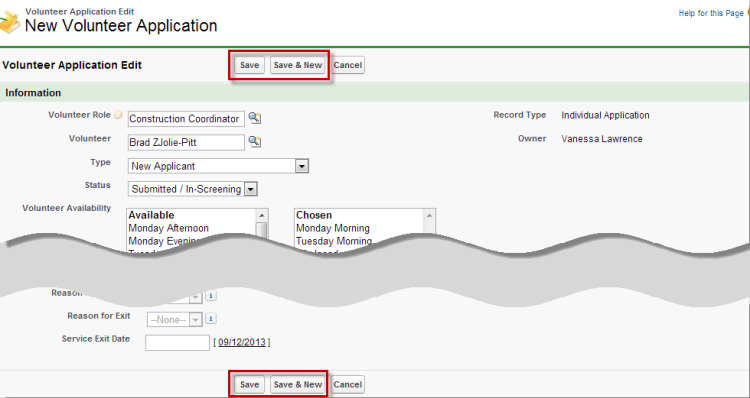 If you choose to use the Save button, you will see the volunteer application detail page.